It’s half term, Mummy, Daddy, Sapphire, The Viking and me went camping. For 3 nights we slept in a yurt. 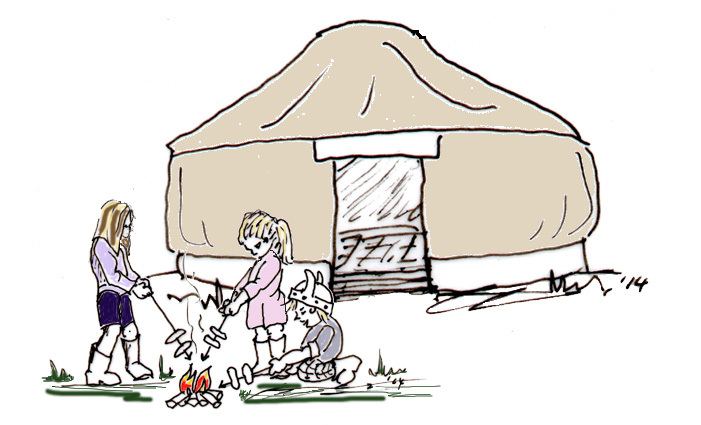 A yurt is a humungous funny shaped tent. The Viking wanted to know why it was called the same name as those little fruit yoghurts! Little brothers! It was fun, we cooked sausages and baked potatoes on a camp fire. When we got home, it seemed such a long time since we’d made our secret plan (Blog 17) to take our thank you present to Trisseen and J’ree. 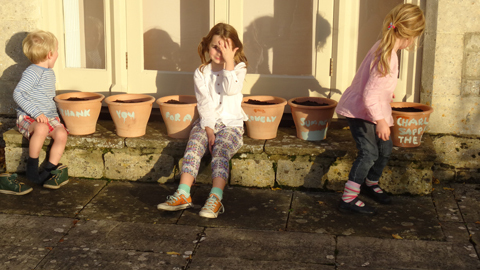 At last…….. yesterday we put all the pots of bulbs we’d planted into Grandpa’s car and off he drove. He took Mummy as well. I thought of that idea because I was worried that if Grandpa was talking to J’ree about music Trisseen might decide to do some gardening. So I thought Mummy could talk to Trisseen inside the house. We opened the boot of Grandpa’s car and carefully carried the pots to the step where The Viking sits to put on his shoes. We made sure they were in order so the message was correct.The Viking was so excited because Sapphire and me said he could go and tell the grownups to come into the garden. We crept to the back door and tiptoed through the kitchen and into the sitting room. “Ta Da……” shouted The Viking. Trisseen and J’ree were so surprised to see us. Sapphire, The Viking and me all spoke at once……….”Come with us, we’ve brought you a Thank-You-Present.” It was so exciting, we had kept the secret for such a long time that we couldn’t stop jumping up and down. J’ree and Trisseen liked the pots. I’m sure they’ll like the bulbs when the flowers come in the Spring. It’s nearly winter now and Sapphire said she was still worried about the animals who live on the Isle of Oug being cold and hungry. 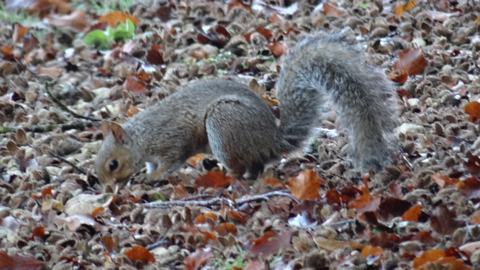 J’ree told her that the squirrels had been very busy collecting nuts and burying them in the ground to store them so that they have lots to eat in the winter. AND I’m going to tell you a disgusting story. 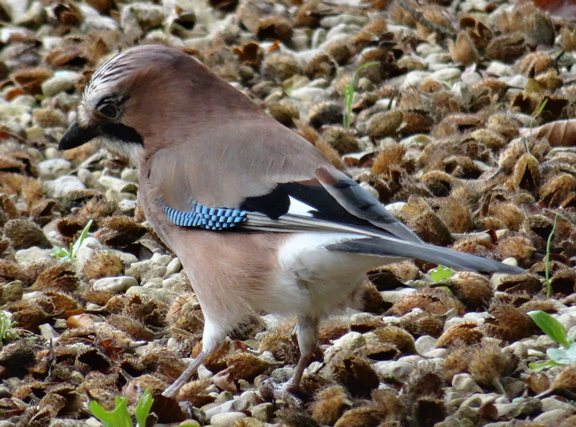 The Jay is a beautiful bird with pretty coloured feathers. 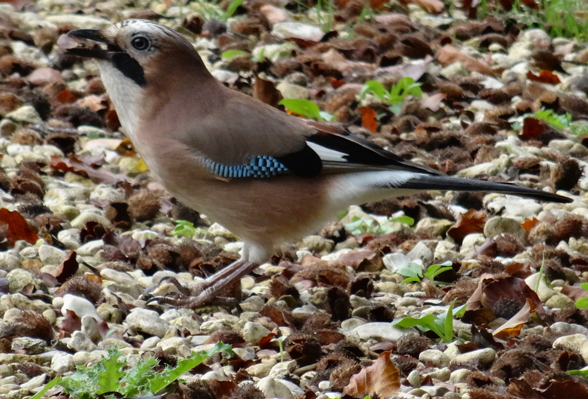 BUT he eats his food and then sicks it up and stores it in the ground to eat later. Isn’t that yucky? 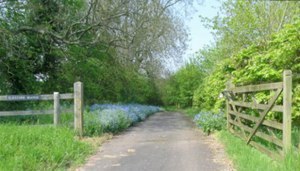 This entry was posted in children, children's games, children's stories, country lore, countryside lore, innocence, nature, outdoor+games, The Joy of Childhood, wildlife and tagged adventures, childhood, children's+stories, country lore, nature, outdoor+games. Bookmark the permalink.